Minimalist design and sleek lines allow SecureView Security Screens to integrate seamlessly into the look of your home, while its elegant translucence brings a sense of the outdoors in. SecureView’s extensive colour range is designed to blend effortlessly into your home. Select from our classic colour range, or we can custom match the colour of your choice. Talk to your local SecureView expert for advice on the right colour-finish for your home. The intrinsic warmth of wood allows SecureView to match the earthy aesthetic of your home without sacrificing your security. SecureView wood effect provides a stunning replication of wood for an understated touch of elegance. Sleek design coupled with steadfast strength make SecureView the ultimate contemporary fencing solution. SecureView screening is ideal for balcony balustrades, translucent garden fencing panels, and secure pool fencing. SecureView is at the forefront of heavy-duty safety solutions. Unobtrusive yet robust, cyclone screens are designed and rigorously tested to ensure your home or office is protected from the impact of flying debris in a disaster situation. SecureView fire and emergency exits integrate seamlessly for superior protection and peace of mind. 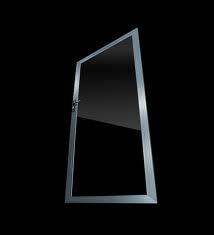 Impenetrable from the outside, SecureView fire and emergency exits boast a quick-release latch to allow a simple and swift escape in the case of an emergency.